To pay tribute to Obiageli Ezekwesili, Vice President of the Africa Region, World Bank, as she completes her assignment, a reception was hosted in her honour yesterday, 28 March by The Woodrow Wilson International Center for Scholars, the Tony Elumelu Foundation and the Whitaker Group. President Paul Kagame of the Republic of Rwanda was invited to grace the event which took place at The Wilson centre in Washington. 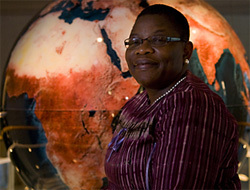 Oby Ezekwesili, the former Minister of Education and Minister of Mines and Minerals for the Federal Republic of Nigeria, came to the World Bank with a demonstrated record of achievement as a pioneer and public servant. Under her leadership in the Africa Region, the World Bank’s lending to Africa rose exponentially to over $40 billion, which was dedicated to agricultural development, economic empowerment and access to health, education and financial support for the most vulnerable in the region.